The number one traffic source for webpages is by far Google. I want to have many visitors (we all do) so I somehow have to attract the attention of the worlds biggest search engine. 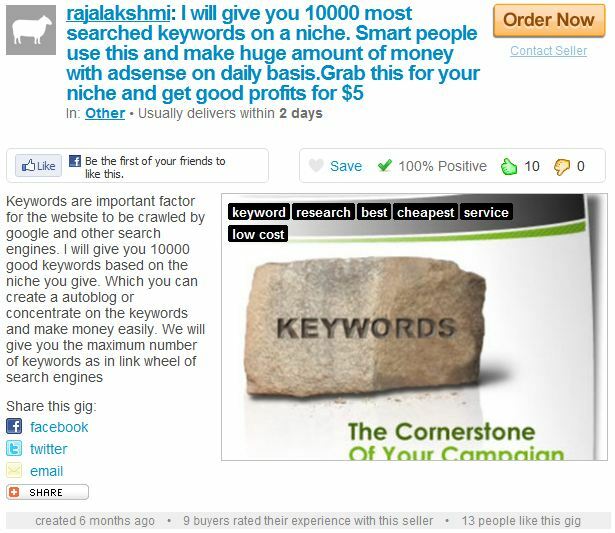 One way of doing so is to use the words people use when they search (a.k.a Keywords).Found Rajalakshmi who will give you 10000 most searched keywords on a nice. He also writes that smart people use this to make huge amount of money. I like how he is feeding my ego, I want to be a smart person with huge amount of money. Of course I’m going to press “order now”. I recieved the following file: wordstream_keywords_20110325_freelancer.zipThe zip-file contains two csv-files with 10 000 words in each (yes, it’s true, he delivered twice as much as promised!). One containing a lot of versions of “freelancer” and the other “outsourcing”. Nothing about fiverr though. There is a number connected to each keyword, but I don’t know what it’s about. I got curious, who is Raymond Weil and how come everybody wants to hire him? It turns out he is not a third world country php coder but a watch maker in Switzerland. Freelancer is also a video game where you can roam the galaxy as a bounty hunter. I thought my niche was “digital services traded online” but it seems like I’m also competing with old school watches and games from Microsoft when it comes positions in the search result.I don’t know what I should do with the 20 000 words I got. I don’t know what the number is (searches per hour/day/month/millisecond??) and I don’t know what to do with all the words. I can’t figure out how I am supposed to make money using this list. I guess I’m not such a smart person after all.Maybe I should ask somebody on fiverr. Fredrik wrote a comment saying that we really needed a favicon. You should always listen to your readers, so I went searching for a favicon.Found Eyashwant who is willing to create a favicon from our logo for puny five dollars. Well, I found several favicon creators, seems like it’s a big business, but Eyashwant wrote that she (don’t know if Eya is a girl, but the name sounds girly) could deliver within one day. I can’t see why one should have to wait longer for a few pixels so Eyashwant is our girl (or man, with a girly name). This is what I recieved: It’s small, like it should be. I can’t decide whether it looks like something I created the first time I was drunk (hint; it rhymes with “nuke”) or a red duck pointing a ray gun at the sky (which is pretty cool).To be fair, Eyaswant didn’t have much to go on. This favicon is probably the best somebody could create using our logo as a base. And if it is supposed to be a red duck conquering the galaxy using future weapon technology, it’s awesome. Url: check. Logo: check. Slogan: check. The next move is to create a better theme for this site. Using the standard Twenty Ten screams newbie-blogger and will probably scare away all possible groupies.Searched on Fiverr and it was a bit hard finding somebody who would do an entire new theme for me. Sure, a lot of gigs promised to “send me” a bunch of themes but that is not what I want. 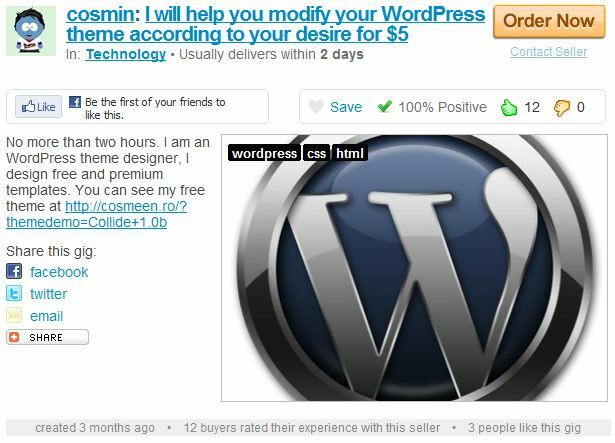 I already have a lot of themes on my computer, I need a new theme developed just for this site.After a bit of searching I found Cosmin who is willing to modify my wordpress theme according to my desire (for the price of $5 of course). I was looking for a brand new theme (making me unique on the interwebs) but modification will probably be enough. It takes guts to dare change something downloaded from the internet. Having a modified Twenty Ten might make me look like an experienced webguru which is way better than just being unique. Hi Cosmin!I would like you to modify the standard Twenty Ten theme. 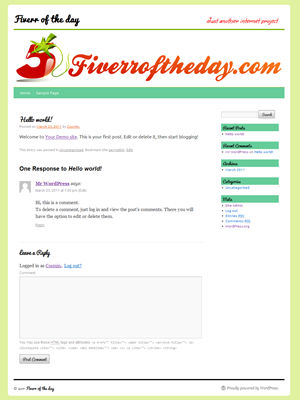 I have just started this site: http://fiverroftheday.com and just put up a freshly purchased logo. Could you modify the theme (changing colors, fonts and stuff) so that it will follow the same style as the logo (red, green, curvy, rounded, fun and a bit childish)?You can send the result to me as a zip, I can install it myself. Please let me know if you need anything more from me.Best regardsToreThe ending paragraph; “please let me know if you need anything more from me” is my standard text I use when I send messages to freelancers in my daily work. It works pretty well. A very childish theme indeed. It’s not even a modified Twenty Ten but a child theme for Twenty Ten (all you wordpress coders out there now what that means).The new official theme for this site will be up and running later today. Gig number three, choose the most awesome slogan! In the last gig, I got 10 “killer” slogans from Laylow making it very hard for me to choose the right one. But help is not far away. Remember the theme from the worlds greatest franchise of the ’80s: “If you cant decide, on a cool slogan, who ya gonna call?” (It’s Fiverr! )Today I tried to find advice to once and for all settle the slogan issue. I found a lot of gigs wanting to give me advice on critical life decisions. This is more than critical though, we need a real marketing expert. 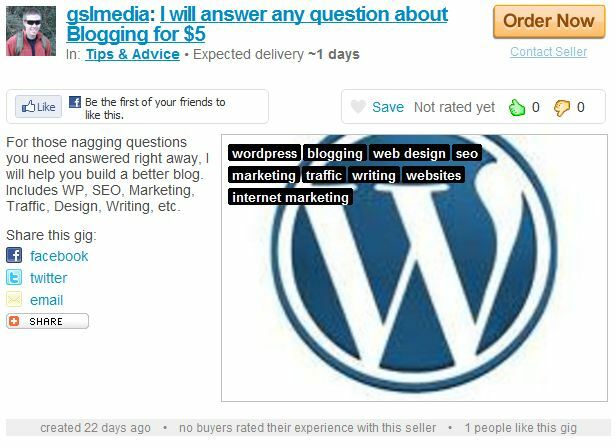 Everybody knows that a bad slogan can sink an internet project so quickly you might think you’re back at year 2000.Found Glsmedia who will answer any question about blogging for $5: I first found other internet marketing experts but they all wanted 5 days to give me an answer. I believe that if you are a true expert you should be able to answer much faster. Thus, gslmedia is our guy! Hi! I just started the blog http://fiverroftheday.com and need an advice. I bought “10 killer slogans” on fiverr and now I can’t decide on which one to use. Please look at the 10 slogans in this post: http://fiverroftheday.com/2011/03/23/gig-number-two-a-slogan-for-the-site/Please tell me which one will be best for the blog and why.Your answer will be published on the blog. “Hey,The name of your site is already pretty descriptive of it’s content, which is what a tagline is usually for. I would go with option two but shorten it a bit:“Your Daily Dose of Fiver Gigs”It explains a little more about the site.or, based on your site’s mission statement, what about:“We Buy and Rate a Gig a Day” It has a good rhythm to it.Thanks”My first impression was “great advice” but then I realised that I was still stuck on square one: I still have to make a choice! Why did he have to suggest one more slogan?So I did what any experienced decision maker would do in this situation: I flipped a coin. The slogan for Fiverroftheday.com will be: “We Buy and Rate a Gig a Day”. Posted in Gigs	| Comments Off on Gig number three, choose the most awesome slogan! Update on the first gig, the logo is done! I just recieved word from one of my fiverr minions, the logo ordered in the first gig is done! And oh boy, it’s a really nice logo.The supplier even gave me two logos to choose from so I flipped a coin again. This is the result, the new logo for Fiverroftheday.com from Pritish: It’s not twitterrific but it’s all right. If I grow tired of it I could always switch. A new one is only five dollars. Posted in Gigs	| Comments Off on Update on the first gig, the logo is done! Gig number two, a slogan for the site! Like all great projects this site need a cool slogan. 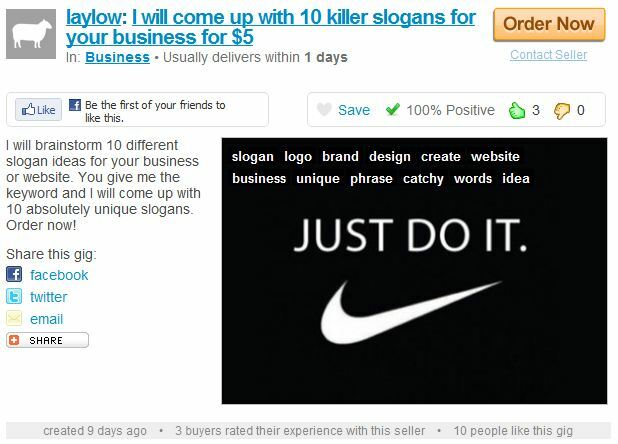 What better way of procuring one than ordering it on fiverr?I searched for “slogan” and found laylow who will come up with 10 killer slogans for $5. I really like the “killer” part. All new products need a “killer app” to be successful but I don’t think I can buy that for $5. I hope a killer slogan will be enough.Getting more than one slogan to choose from sounds nice but it also produces a problem; how will I be able to choose the best one? The paradox of choice is not something I want to battle with. Maybe the next gigg should be to pick the most lethal one of the 10 killer slogans.Only three buyers have rated this seller but the text “Just do it” convinced me to take the plunge. I pressed the “Order now”-button.Unlike the last gig I got a notification this time telling me that the seller wanted extra information. I wrote a message to him saying what I needed. I couldn’t think of any keywords but I hope he will do something awesome without much guidance. In less than 24 hours I recieved yet another mail saying that my package was delivered, that was really quick! This was my first delivery (the logo project said it would take at least 48 hours) so it was a new experience. I really liked the package picture on the right. Gives me the feeling that I’m actually recieving something real and not just digits in cyberspace. Get your daily dose of fiverr gigs. a fiverr a day, a radical new idea. a fiverr a day, something for everyone. free a fiverr with every purchase. Problem? The Solution:a fiverr a day. First impression is; I’m still alive. Then I realized: The good thing about ordering 10 is that at least one or two will be good. Now I just need to figure out which one.That will be the next project. Hiring somebody to the choosing for me. I will look for an internet marketer who is confident enough to sell his services for only $5 and still believe he can make a profit. Posted in Gigs	| Comments Off on Gig number two, a slogan for the site! Like you say in the valley; “getting an awesome logo is the number one key to success”. (can’t remember if it was Jobs or Zuckerberg) Where would Twitter be without their “fail whale” or Facebook without their famous blue and white F? The first order of business for any startup with self respect should always be “Get a cool logo”. 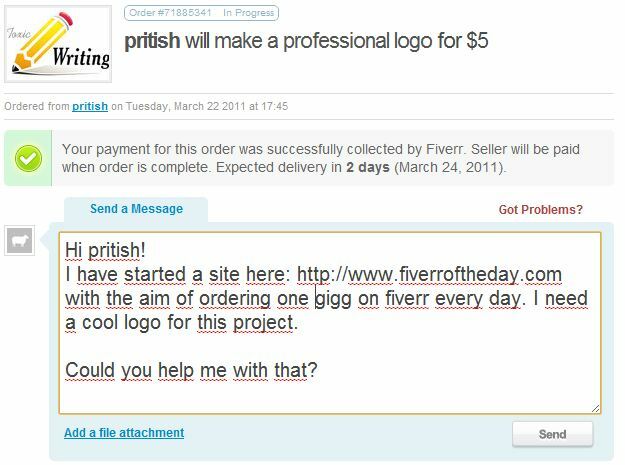 Or maybe its “Get a cool URL” but I have already done that (fiverroftheday.com).Searched for “logo” on fiverr and found pritish who will make logos for 5 dollar. He had 8 thumbs up so I pressed the “Order Now” button and paid via Paypal (8 thumbs must mean that he is a nice guy, I mean; you have to trust the thumbs).I thought using paypal was very quick, I only had to enter my password and voilá; I had five dollars less, but Fiverr told me there was a quicker way: I guess I have to try “DamnQuickPay” considering the large amount of gigs I’m planing to purchase. Saving a second per gig will mean a lot of hours in the end.After a few minutes I recieved a mail from fiverr thanking me for my order. It also included information on how I could communicate with pritish. I thought that the best idea for me right now was to tell him what the logo was for. Now I wait for his reply. I hope he is quick, I can’t wait ordering another gig.The next gig will probably be a new tagline. Every new startup or internet project should have a cool tagline. First post, what is fiverr of the day? I have worked with online freelancers since 2007, buying their services via various forums, escrow services and sites. I have followed, and lived with, the evolution of sites like freelancer.com and odesk. Never before have buying services online been so easy as it is today.The latest mania is buying extraordinary cheap services on fiverr.com. A site where everything has the same price; 5 dollars. You can get anything from “quality” backlinks for your SEO pleasure to a guy peeing your name in the snow. 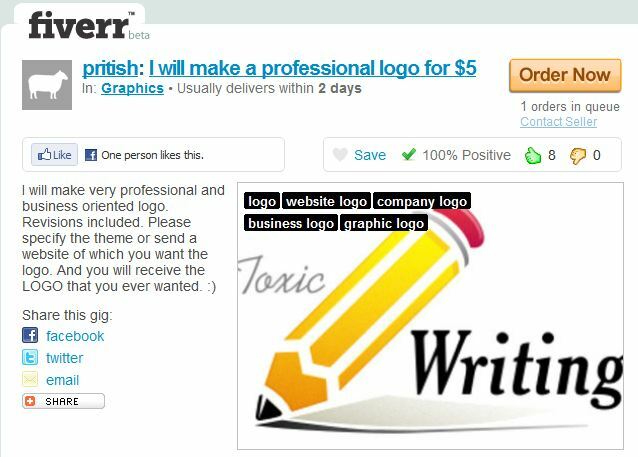 Fiverr.com is not only aimed at professionals like me (buying php-code, PSDs, wordpress themes, content and hiring virtual assistants) but also aimed at regular people who just want to buy something fun. This is something new in the online service sector. And that is what makes the site so fun.Being able to quickly buy services online opens up oppurtunities never before known to man. 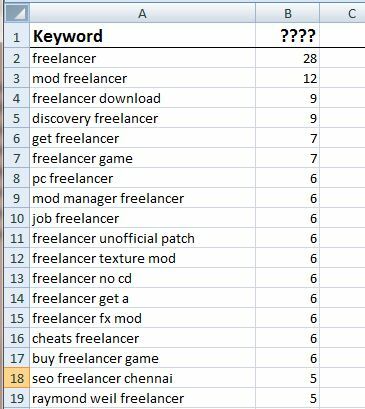 This blog is about exploring those oppurtunities, what can one create using only cheap freelancers online? How can we collaborate online to create new and wonderful things together? Are the possibilities real and endless or am I just imagining things? Every day I will buy and rate one gigg from fiverr.com. The giggs could be anything. It could be giggs to help develop this blog, promote it and make me famous. It could also be giggs aimed at providing me, and me alone, amusement. In other words; anything goes (and the giggs will probably not cure cancer or bring about world peace).I will try to use fiverr giggs as much as possible to manage and develop this project. I have a day job (managing IT-outsourcing for Swedish companies) so my time is limited. Thus, the success or failure of this project is entirely in the hands of the fiverr community.I hope you will enjoy this site. 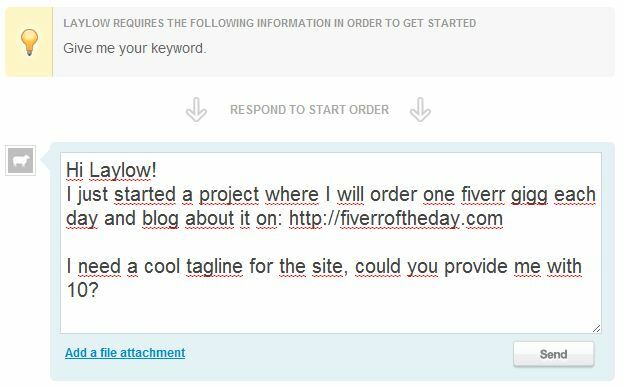 Posted in About	| Comments Off on First post, what is fiverr of the day?